LISTENING NOTES: Perfect for Dancing: Edmundo Ros' "Hi Fi-esta"
Perfect for Dancing: Edmundo Ros' "Hi Fi-esta"
Another great artist on London is Edmundo Ros and his Orchestra, who helped popularize the dances of Latin America both in Britain and here in America. 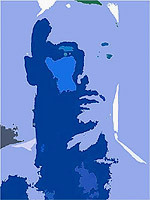 His successful formula is to take popular standards, and arrange them with a Latin beat, which as stated in the subtitle for this album, are "perfect for dancing". For example, "April in Portugal" is now a cha cha cha, "La Vie en Rose" is a baion, and "Under the Bridges of Paris" is a mambo! Side Two opens with a samba treatment of "National Emblem" a standard in the repertoire of military bands as a march. Other treatments include a mambo, fox trot, tango and waltz. The immaculate tempos are executed with the precision and panache that Ros and his Orchestra are famous for. 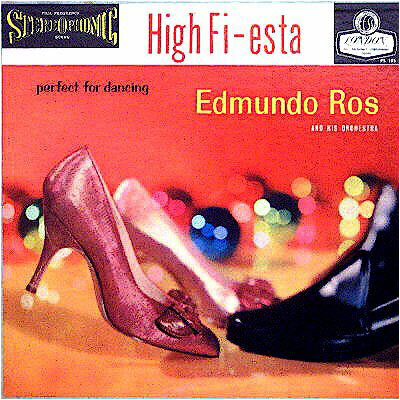 For a time, Edmundo Ros owned and headlined his own very successful club in London, and this disc just might transport you there! Ros cut at least a dozen albums that appeared on the FFSS Blueback series, and still others under London's Phase 4 label. Although the Phase 4 technique was hailed as a breakthrough, the multiple miking and spotlighting used in that technique somehow drained the feeling of live musicmaking, which the earlier bluebacks have in abundance. Other titles of note are "Ros on Broadway"(London PS 152), "Rhythms of the South" (London PS 114), "Hollywood Cha Cha Cha" (London PS 152) and "Ros at the Opera" (London PS 179). In regard to sound, I fail how to see this recording could be bettered. Brass instruments full and rounded yet sharp and forceful when called for, woodwinds are smooth and melodic, and the varied percussion including bongos, timbales, tumbadora and maraccas punctuate the tempos with uncanny precision, with their individual character fully intact. The entire bandwidth is utilized, while the stereophonic effect adds the natural space and depth of a live performance without any gimmicks that were common in the early days of stereo. The bass foundation is deep and natural. The technical limitations of the cutting heads of 1958 mastering equipment are not in evidence here - high frequencies are not excessively hashy or bright. It is essential to find a clean copy, unplayed if that is possible. Distortion is a certain if the record was played often on a poor setup or with a worn stylus. I did have the British Decca release on hand and did a side by side comparison with the London pressing which was pressed by Decca for export to the USA. Aside from a personal preference for the Decca's jacket design, The two were indistinguishable from one another. I am fortunate that both of my copies have very quiet surfaces. Highly recommended!